Now log out and log in again. 1. Run "xrandr" to find the NAME of the output you would like to make primary. In my particular configuration I have an external monitor hooked up to my laptop on the left of the laptop display. The unity bar is ending up on the laptop display though making it in the middle of the two monitors. This makes it quite difficult to activate the bar with a full screen application open on the laptop (hitting the upper left pixel of that monitor without going over). I think it would make more sense to make it configurable which monitor the bar ends up on, or at least look at the orientation of the monitors when determining where to put the bar. confirming from the duplicate bug report. Thanks, Seth. That worked for me. I found actually that both monitors were set to "no". So I guess it was just picking the first in the list. Same here, both were set to "no". It took a little trial and error to figure out which of the <output> sections to hack, but this did eventually work for me too. Please make it configurable BEFORE launching Natty!!!!!!!!!! The problem really is a design problem!!! Even if the bar shows up on the left-most monitor, that's not what I want if that's NOT my main monitor!! This bar needs to be on any configurable position - at best at the bottom... because only there it's "safe" from left/right problems! monitor it's on may be necessary to appease the masses. I would like to add that I have found Unity unusable in my current setup because of this issue. The launcher is currently showing on my primary monitor, but my primary monitor is on the right of my multi-monitor setup. This makes bringing the launcher up almost impossible by using the mouse position. It also makes the launcher position VERY inconvenient, breaking the workspace up the middle. Until Unity gives an option for the launcher to be moved, I'll be using the reluctantly using the 'classic' desktop. I have to agree with Brian (comment #8). Since the launcher and the hot corner are designed to be at the top-left, they also should show up on the top-left monitor. Everything else either makes activating the launcher with the mouse very tedious and has design issues like splitting the whole display in two or would require further design work. I have two monitors setup and the unity launcher stay on the left of right monitor, then being positioned in the middle off the composed screen. It's very annoying because sometimes i accidentally move the mouse pointer to the left monitor when trying to show the launcher in the right screen making hard to use it. I have found a work-a-round for this issue using xrandr and changeing the primary monitor. My setup is similar to what has been described above, placing a big monitor to the left side of your laptop will give you the launcher in the middle. To see it you have to get to left side of the left screen to get the launcher back, which is annoying. However I like to keep the launcher on my laptop. When I attach my laptop to a beamer, I do want all people to see the launcher popping up when I have to start an application. Now I could put the beamer virtually to the right side to solve that again, but I was thinking of a more elegant, but more complex solution. It would be more elegant to be able to choose the monitor to show the launcher (which can be done by the ability to choose the the primary I guess), and then be able to position the launcher to the left or the right side on that screen. It would be even more elegant to store the setup for different monitor setups. So when I connect to a beamer it will attach the launcher to the right side on my laptop screen, and when I connect my normal screen it will automatically switch to the left side of the monitor instead. Actually monitor settings are already stored, so probably the only thing that has to be added is the positioning of the launcher, and a nice repositioning effect off course. The ability to choose another primary screen does not solve the issue (without the need to log out and in at least) When I use xrandr to reselect my primary, it does not transfer the launcher to the right spot. The dash moved immediately to the left side (but did not resize, giving me a dash the size of my laptop on my much larger monitor). The launcher however still resides on the laptop, giving it a disconnected and misplaced look, and still only opens when I touch the left part of my monitor. I guess both are refreshing issues. Unfortunately xrandr workaround is no good for the users with nvidia cards. AFAIK xrandr sees dual screen setup as one big screen. I'm experiencing the same problem with my dual-monitor setup (with a nvidia graphics card) in unity (3d). 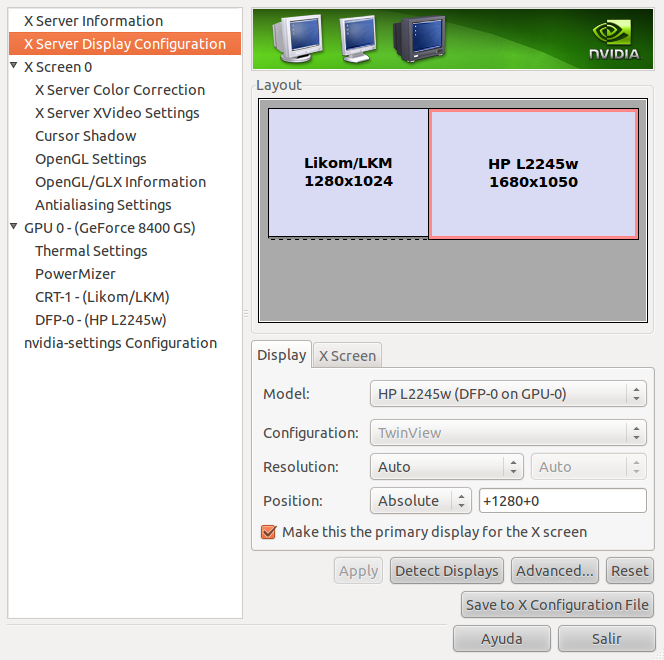 When I use the Nvidia X Server Settings tool to expand my desktop to the second monitor (TwinView), the launcher (including the ubuntu botton on top) ends up in the middle of the two monitors, or if you will, on the left edge of the right monitor. My primary monitor is my laptop, to which I've connect an additional monitor to the right. So when I connect the right monitor, I definitely want the launcher to stay at the left most monitor, which is my laptop. 3.) now, the launcher will be on the left edge of the second monitor, even though we told nvidia x settings to make the laptop be our primary monitor!! Setting up the monitors as described above is the only way I get launcher to position on the left most monitor! I have a desktop monitor and an HDTV as my secondary. by HDTV serves 3 roles: TV, Office Display (windows), and Home computer (Ubuntu) display. I followed Seth's suggestion (#4) and successfully moved the launch bar to the left-most display. When I did this, the login screen switched to my HDTV. Anyone know how to shift the login screen over over to my primary, as well? This is a terrible inconvenience! Thanks in advance (and thanks Seth!). I just stumbled across a very useful blog post which fixed my dual-monitor setup problems! The short python script works like a charm for me and cloning/extending my laptop screen to a second monitor only takes me 1 click! The launcher appears on the right side as well, without enabling/disabling everything twice (as described in my post above). Set, how does the monitor.xml have to look like? I don't have it on my system. I use disper for switching, and I have the same problem as Bart (comment #16) - I would like to keep my launcher on my primary, right screen, for similar reasons (bug #806909), so I'd argue that there's use cases for that configuration, too. The relevant code generating the output request that information directly from Glib, and as you can see, the first time round the external monitor (the one with the 1920x1080 resolution) is activated, the built-in monitor is reported to be the primary monitor and the arrangement is also wrong. The second time the external monitor gets activated, the information is actually correct. Sorry, that should have read Gdk instead of Glib. The function I was talking about is Uscreen::Refresh(): http://bazaar.launchpad.net/~ubuntu-branches/ubuntu/natty/unity/natty/view/head:/src/UScreen.cpp#L93. how about only showing the unity launcher on the screen that the mouse is on? And have it fade in/out on transition? It just seems like a simpler solution than cloning the panel for each screen, or extending it. If there is no primary monitor defined, as seems to be the default, then unity should use the monitor which is positioned at (or contains) coordinate 0,0 of the desktop. That's the top left. If a primary monitor has been specified in monitors.xml then continue to use that. The root cause of this bug is the function gdk_screen_get_primary_monitor. Unfortunately it is designed in a way such that it returns the same value 0 if the primary monitor is the first monitor, or if there is no primary monitor set at all. So calling that function (which unity does several times) you can't possibly know if a primary monitor has been set or not. It seems the only reasonable fix is to fix GTK itself so that if no primary monitor is set, it should return the ID of the top-left monitor. NOTE: These docs are slightly wrong because they suggest monitor-related functions take a monitor number between 0 and n_monitors inclusive. 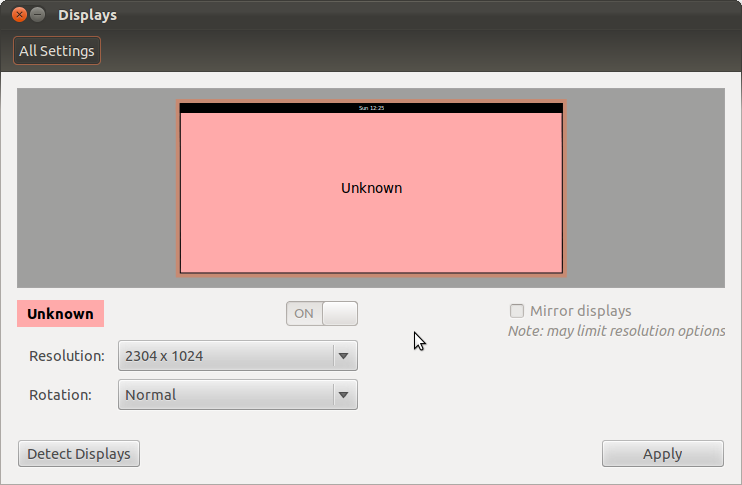 However in actual fact valid monitor numbers are < n_monitors, confirmed by reviewing the GTK source code. Thanks Andrea, that sounds like good news. And an obvious feature that was missing from Monitor Preferences in natty. Will this work with the NVIDIA drivers? @Michael. I've an Intel card but I think it should work! This bug also affects me, I also believe that the same problem of not having the primary monitor on the left causes a problem with the workspace switcher placement. See attached screenshot. Workspace switcher placement is still broken when left monitor is set as primary. It seems that unity ignores the primary monitor setting in some situations. in a portrait-wise orientation). I believe this setup to be quite common. on the desktop, the launcher shows up on the leftmost one. correctly on the right monitor. We unity 4.18+ the launcher is shown on the monitor to the left. This is the wanted behavior. your big monitor (because there is no space on your desk on the right for instance etc...). won't cut it in many situations. Plus that makes the "black bar" in the Display property completely useless and confusing. Anyway I've patched it locally (see rev. http://bazaar.launchpad.net/~unity-team/unity/trunk/revision/1609 for those interested) to suit my needs but I'm just curious to see how this design issue will be solved. I was really hoping Andrea just made a mistake and was meaning to say that the launcher was going to be displayed on the monitor on the right. Based on Kim's response it appears not to be the case and i'm quite surprised to hear this. It might be the implemented behaviour now, it's definitely not the wanted or desired behaviour. People set a monitor as primary for a reason: to use it as the primary one. That's were you want your primary actions and work to take place, that's were you have your main attention on, your main workarea. This definitely includes the launcher as well. Now you'd constantly have to divert your attention by moving all the way to the left of your left screen to get to the launcher. A non-primary might not even turned on all the time. Primary GUI items should be on the monitor the user considers the primary, no matter its position. This so called permanent work-around (modifying ~/.config/monitors.xml) doesn't work for me. Ooh, yeah, that's right; notifications end up in the wrong place on multi-monitor setups too! That would be a real problem for me if my second monitor even worked (right now it doesn't; I'm getting a weird overlap effect: http://ubuntuforums.org/showthread.php?p=11410701#post11410701 ). I'll make sure to vote for that bug too, thanks! Hmm, on second thoughts that's not the same as the bug I've seen. Although that bug is probably only visible when the fix for bug 742544 is applied, we should still treat it as a separate bug. Because the launcher/icon code is quite separate to the code changed to fix 742544. There may still be yet more parts of Unity which make the same bad assumption that the launcher is always on the left-most monitor. But they should be treated as separate bugs because the symptoms of each will be subtly different, and so will the fix. Well one thing I can think of is the "dodge" animation will probably look kind of weird when not on the leftmost monitor. I know the Gnome panels used to have a problem where auto-hide would cause the panel to "hide" by sliding into another monitor's view. Maybe instead of a "sliding" motion, it should be more of a "flipping" motion, as if it were a flat piece of glass on a hinge attached to the monitor edge. That would probably be a design issue, but it would only apply when the launcher can already be moved to a different monitor. So I don't think the floating icon bug it's related to this one. "Primary" "true" under relevant "Monitor" section in /etc/xorg.conf. This was under 11.04 but may help you. Have you managed to get dual screen working under 11.10 with nvidia? Are you able to rotate single monitor screen? 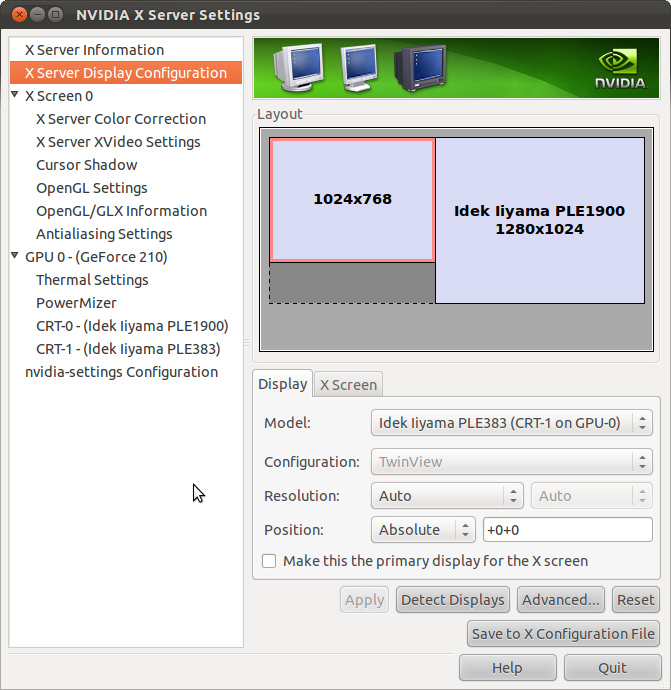 @marzal, please open NVIDIA X Server Settings and make sure you have the box ticked for "Make this the primary display for the X screen". It will give detailed information about your monitors. 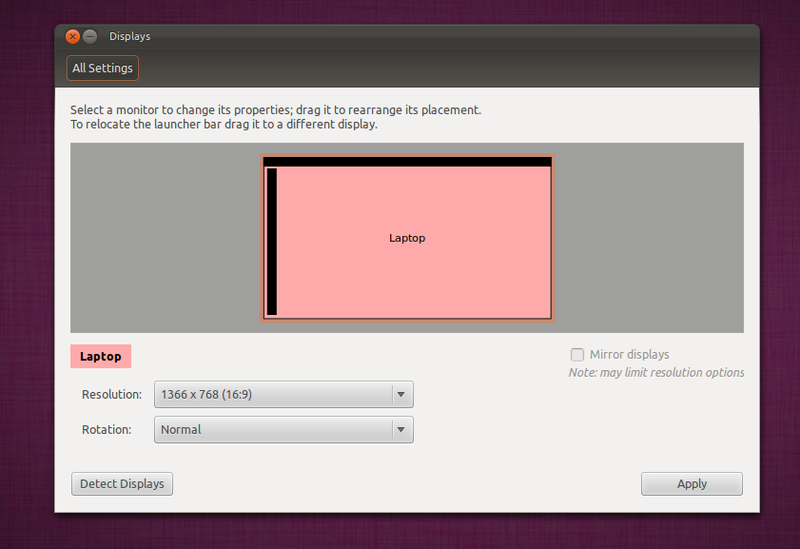 I added this in version 4.24.0-0ubuntu2b1vv1. Hi, I have cheked the "primary monitor" on the frontal monitor. It was workig with the ppa fix until the las update. UScreen: No primary monitor has been configured via Xrandr. Using left-most monitor: #1. UScreen: Primary monitor for Unity is #1. OK, the problem seems fairly clear. NVIDIA doesn't implement xrandr. So the fix either needs to be enhanced to support Xinerama or simplified back to the form of the original temporary fix. A little research seems to confirm that the "primary" monitor, according to NVIDIA, is always monitor 0. And which monitor is reported as #0 is controlled by Option "TwinViewXineramaInfoOrder". OK, I have added NVIDIA/TwinViewXinerama support to the fix. So in theory if you have set a primary monitor in NVIDIA X Server Settings then Unity (4.24.0-0ubuntu2b1vv2) will now honour that. The new version in ppa:vanvugt/unity is 4.24.0-0ubuntu2b1vv2 and is building. When it is published, please try it and let me know how it goes. Thanks Daniel - will try that. Now: I got a new problem, also associated with the honoring of the primary monitor setting: the pop-up notifications unity displays are always on the right edge of the VIRTUAL, the complete desktop. But that is far, far away from where I notice it! So: it is more or less useless! Is that possible? Where should I file this bug??? Could you also fix that? Thanks Daniel for your great job! Finally I can use Unity, but there's still some few problems. I have Nvidia Twinview setup with my main monitor on the right side of notebook. When a launcher is between screens there's problem with restore from hide, it's not possible. I must set in ccsm never hide of the launcher. Next problem is workspace switcher. On the main monitor is broken - there's a lot of artifacts. Tomasz Przybysz (topr): a bit off topic? It's completely off topic :-P Please stick to e.g. the forum for support questions. @zordid, I think the issue with notifications only appearing on the top right monitor is probably logged already. Just don't know the bug number. @xjcook, Yes having a launcher in the middle of your monitors only really works if you have it set to never hide. I suspect someone might have already logged that bug back in Ubuntu 11.04 when it was still possible to put the launcher in the middle of the desktop. UScreen: No primary monitor has been configured via Xrandr. UScreen: Primary monitor is #0 according to GDK and confirmed by TwinViewXineramaInfoOrder. UScreen: Primary monitor for Unity is #0. This was working great since my post #73 above until I rebooted this morning. Now the launcher is back to being stuck all the way on the left monitor and the settings->Displays does not have the black bar for me to drag the launcher back to the "middle" of my desktop (left side of my primary monitor). ii libunity-core-4.0-4 4.24.0-0ubuntu2b1vv3 Core library for the Unity interface. 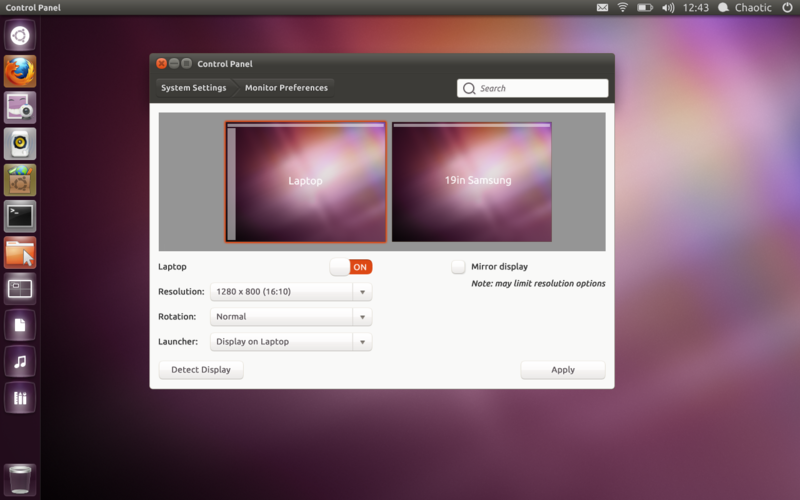 ii unity 4.24.0-0ubuntu2b1vv3 Interface designed for efficiency of space and interaction. ii unity-common 4.24.0-0ubuntu2b1vv3 Common files for the Unity interface. Are you using NVIDIA driver with TwinView? My config after reboot the computer is still OK. Nothing in my xsession-errors about UScreen at all. I renamed the old one, logged out and then back in again and ran the System-Settings->Displays and attached the resulting xsession-errors here. See anything interesting in there? Very strange - I just noticed it looks like I have unity-2d running? Why is that? I have a pretty decent machine (Core i7 860 with NVIDIA GeForce GTX 275 graphics) so it should be running Unity 3D right? OK, I fixed it. Somehow my NVIDIA drivers were messed up. I removed all nvidia drivers (nvidia-current et al) and reinstalled them. Upon reboot my launcher is back in the middle of the display surface (left side of right monitor) and Unity 3D is back. If you're using the NVIDIA proprietary driver then the primary monitor (the one the launcher appears on) is chosen by the "TwinViewXineramaInfoOrder" option in /etc/X11/xorg.conf, which I think you change by ticking the primary monitor box in the NVIDIA control panel. I'm using 11.10 with an ATI card (Radeon HD 3650) and I'm having this issue. I installed the fix from your ppa, but no luck. Basically, the launcher is always on the left screen (as specified by xrandr) and the --primary flag (this is my way of defining the primary monitor) of xrandr is ignored by unity. And I would like my rightmost external monitor to be the primary screen. Any ideas on this matter? Would benefit really a lot from it. And attach the output of the command here. With drivers that have proper xrandr (all except NVIDIA), the preferred way of changing the primary screen is in the Gnome Displays control panel. Drag the little black bar (at the top of one of the screens) to the screen you want to be primary. the grep command does not give me any output. I did however install all the upgraded files from the ppa with synaptic. I dragged the black bar in Display settings to the right external monitor but without effect. Even after restart. Did I miss something perhaps? Joost, if that grep command returned nothing then you don't have the fix installed. Because the fixed version in my PPA will always write messages containing "UScreen". Ok I see what's happening now. The dpkg command tells me the fix is installed, but it seems to be only for Unity3D, not for Unity2D. And I'm using Unity2D since Unity3D is heavily slowed down with ATI cards using the fglrx driver. Moving windows is chunky. I logged back in with Unity3D and the launcher is now on the correct screen. Unfortunately I have to use 2D because the graphics are too slow in Unity3D with my card. Ok all is solved now. I unchecked the Sync to VBlank option in ccsm and the lag is gone in Unity3D. I'm now fully operational. :) Thanks! Good to hear. It sounds like this bug might be in unity-2d too. I certainly haven't proposed a fix for 2D yet. ATI Radeon card and catalyst drivers. Daniel, it doesn't seem to work for 12.04 right now. Are you aware of that? I mean, dragging the black bar to the right most external monitor has no effect. Launcher stays on the left laptop screen. Should I file a new bug for this or will you work on that too eventually? No need for a new bug while this one is still in progress. What I read from the title of this bug, isn't it now obselete with the new Unity behavior i.e. to have launcher on each display? Yes, I suspect my fix is now obsolete. Haven't formally tested my multi-monitor scenarios with precise to confirm yet though.